Free Chick Fil A breakfast for Houston readers! 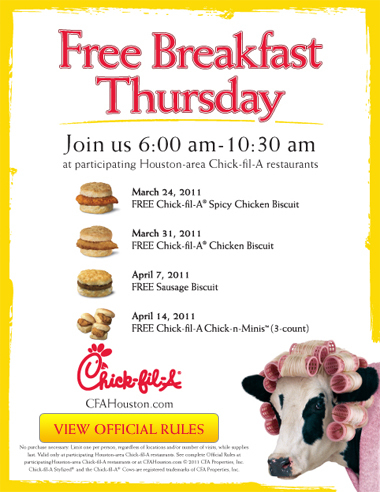 You are here: Home / freebies / Free Chick Fil A breakfast for Houston readers! If you love Chick Fil A, they’re offering free breakfast in the Houston area every Thursday for the next few weeks. 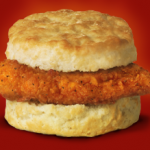 This week, you can get a free chicken biscuit between the hours of 6 am and 10:30 am! You can read the full details for this promotion here. Check for a location near you here. 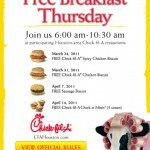 Houston readers: Free breakfast at Chick Fil A tomorrow! 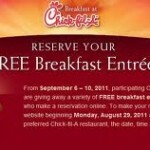 FREE Breakfast from Chick Fil A: Reserve a spot now! 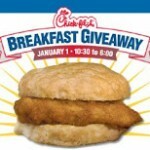 Get a free Chick-fil-A Spicy Chicken Breakfast Biscuit! Chick Fil A – get a coupon for Free Breakfast on New Year’s! Free Spicy Chicken Sandwich for Houston area residents at Chick Fil A on Saturday!